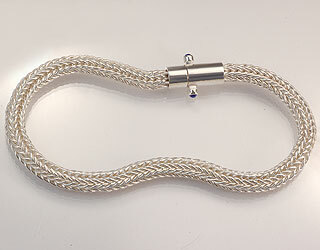 This bracelet is woven by hand using hundreds of fine silver wire loops. The handmade barrel clasp has a white gold tongue for strength and is opened by squeezing the sapphires. I wrote a Step-by-Step article for the February 2006 edition of the Lapidary Journal illustrating how to make this clasp. I agree with Rose, absolutely beautiful. I googled your website from the picture of this piece on the Argentium Silver website. I love the clasp, it's darn near perfect -- add to that the smooth, well woven loop in loop chain and you've made a real work of art. Absolutely beautiful. Understated and at the same time complex in design (although that seems slightly contradictory..), a great piece. Love your work, especially the Roraima and Church rings!